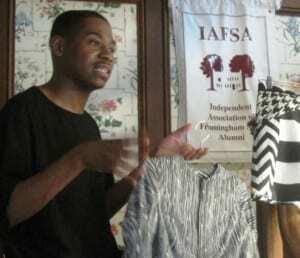 The Independent Association of Framingham State Alumni officially opens its new Fashion & Design Resource Center with a “fashionable” cocktail party! We will be showcasing a unique live model and art gallery mix of student and alumni creations, including an up close look at some designs by Project Runway contestant Cornelius Ortiz ’15. Student designers modeling their fashions will mingle among attendees, providing an experience not available to the general public. Elise Arsenault ’18, a fashion merchandising student and entrepreneur will exhibit and discuss the creation of her SOULS brand wearable artwork shoes. Elise, a classmate of Cornelius, will also speak about the construction of his designs. This event is to benefit the Alumni House Fashion and Design Resource Center and it’s new art and sewing supplies “pantry” for Framingham State art and fashion majors. Event is by advance ticket only. Invitations are in the mail for a reserved block of tickets for Framingham State alumni. Email office@alumnihouse.org for your invitation for our limited unreserved tickets. IAFSA is excited to host this artistic celebration in conjunction with ArtWeekMA.